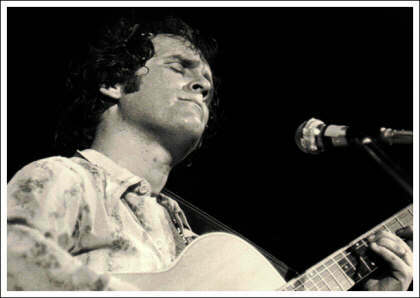 I’m of an age where Tim Hardin‘s Reason To Believe is heard first and foremost in the voice of a late-career Rod Stewart – an inauspicious echo for a song so powerful, and so well-covered. But a good coverwatcher learns to spot trends among the liner notes as he gathers in the sheaves. And so, with today’s culminating feature, we come to honor a gradual and growing awareness of the work of the sixties and seventies singer-songwriter among a generation of artists and fans born after his rise and fall from grace – much of it secondhand, through coverage. Like so many of his long-gone contemporaries, Hardin’s history is dark and disturbing: a long-time heroin addict who showed early promise, he drifted through the Greenwich Village and other, less definitive folk scenes in his early years, ultimately growing to become a featured act at Woodstock and a celebrated member of the radiofolk revival in my parents’ teenage years. Although he recorded nine and half full-length albums before an untimely overdose in 1980 cut his career to the quick, the gentle Oregon-based performer suffered greatly from a combination of stage fright and addiction. For much of his later years, he lost the ability to tour altogether, turning in notably erratic performances when he did find himself on stage, despite continued celebration by critics and peers alike for his work as a composer and studio musician. But even to the end, stylistically, Hardin’s work is worth its early and ongoing recognition. Listening to his songbook, one is struck by his effortless way with melody, typified by waves of sound that rise and fall, pulse and swell through his performance. Lyrically, too, there is a consistency of tone, with confessional songs of deep heartache and disconnection, and the struggle to make sense of the world – topics that so characterize certain songwriters of his era, but run especially deep in such a conflicted personality. The combination of these elements makes for a particularly potent mix: there’s power in his smooth and dreamy approach to songwriting and recording alike, one well-served by that gentle, slightly hoarse tenor and the soft guitar strum, underscored by gentle piano, brushed drums, and orchestral elements, resulting in a catalog that redefines easy listening as a palatable, palpable force laid over a narcotic darkness. Such a splash in his time cannot help but ripple into the present. Hardin’s songs are familiar on late-night soft rock radio even into the new century; his most popular works have been covered umpteen times, with many making it to their own place on the charts. Most versions retain the dreamy, maudlin setting, even as they span decades, from Donovan, Karen Dalton, and The Pozo-Seco Singers’ mid-sixties recordings to newer takes from Okkervil River, Horse Feathers, Damon & Naomi, Kathryn Williams, Jesse Malin, Mark Lanegan, and others pushing the maudlin fringes of folk, indie music, rock and pop in the 21st century. Indeed, If I Were A Carpenter, Hardin’s second most famous song, is technically a cover in the songwriter’s hands: Bobby Darin reached number 8 on the US charts with his version, which was released a full year before Tim Hardin 2, and returned the favor three years later by penning Simple Song Of Freedom for Hardin’s use. But we’ll allow both here, since our Covered In Folk sets are designed to celebrate songbooks and originals alike, and Hardin’s versions are no less seminal.